Experts say New Yorkers should expect to see more of them as they become more comfortable adapting to city streets and parks. 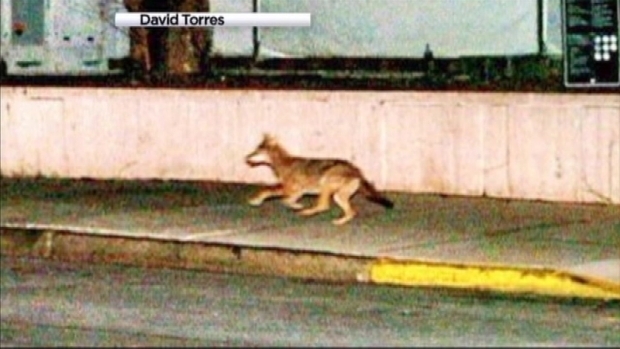 A coyote was spotted again in upper Manhattan Thursday night, the third time this week a wily canid has made a public appearance on the streets of New York City. 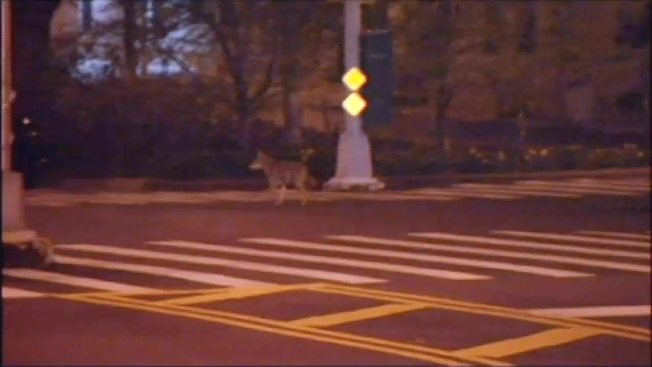 NBC 4 New York cameras exclusively captured the coyote dashing through the area on Riverside Drive and 98th Street just after 10:30 p.m. NYPD units were staked out in an attempt to corral the animal and they moved further uptown as the coyote moved north. The chase took police through Morningside Heights. No one can say for sure, but it appears to be the same coyote that first eluded police capture early Wednesday morning, when multiple people called to report sightings of the animal near West 87th Street, then some 30 blocks away, and finally in Riverside Park. A coyote was spotted again in upper Manhattan Thursday night, the third time this week the wily canid has made a public appearance on the streets of New York City. News 4's Ida Siegal reports. Then early Thursday morning, a photographer tweeted a photo of a canine that resembled a coyote near Lincoln Center. The string of recent sightings in Manhattan has drawn new attention to the wily critters that have been spotted periodically in New York since the 1990s. Experts say New Yorkers should expect to see more of them as they become more comfortable adapting to city streets and parks. Call it coyote urban. "I would say that this is going to be a new normal: that coyotes are going to continually show up in downtown New York City," says Daniel Bogan, a coyote researcher at Siena College. At least four coyotes have been spotted around Manhattan so far this year, and one was seen clambering around on the roof of a Queens bar before disappearing, says Sarah Aucoin, the director of the city's Urban Park Rangers program. Three of the animals were captured in Manhattan and released in Bronx parks with established coyote populations, she said. Police chased after the fourth on Wednesday in Manhattan's Riverside Park, even using a helicopter until the animal secreted itself in deep brush near Grant's Tomb. There's no firm count of coyotes or sightings in the nation's biggest city, but the population is probably at least in the teens, says wildlife biologist Chris Nagy, a co-founder of a study group called the Gotham Coyote Project and the research director at the Mianus River Gorge in Bedford, New York. With some coyotes ensconced and breeding in the Bronx, others are likely heading into Manhattan this spring to seek their own turf, said coyote project co-founder Mark Weckel, a conservation biologist at the American Museum of Natural History. Although coyotes have been hunted for sport and killed as threats to livestock, they're now found from coast to coast. There are an estimated 30,000 in New York state, where they were first noted in the 1930s, the state Department of Environmental Conservation says. Hardy and omnivorous, they've appeared in cities from San Francisco to Detroit to Chicago, where one coyote popped into a downtown sandwich shop in 2007 and researchers have tracked hundreds in the area. In New York, there were at least four Manhattan sightings in 2010 and a headline-grabbing chase in Central Park in 2006. If coyotes have acclimated themselves to living among people, it doesn't necessarily go both ways. The animals are generally shy but sometimes go after people and pets. There have been two coyote attacks in northern New Jersey's Bergen County this month; one man was bitten Sunday by a coyote that tested positive for rabies. Suburban Chappaqua, New York, has been enmeshed in bitter debate over whether and when to kill coyotes after at least 10 recent attacks on pets. There haven't been any reports of aggressive coyotes in New York City, Aucoin said. "We'll just have to adapt our behavior and accept the fact that they're going to be around," says Patrick Thomas, general curator of the Wildlife Conservation Society, who's captured images of coyotes on a motion-activated camera in his own New Jersey backyard.